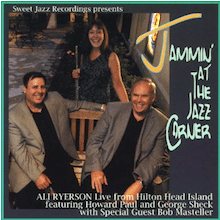 "Ali Ryerson is one of the world's premier flautists, and part of legendary family of jazz musicians. Ali's father Art Ryerson was a top studio and jazz player in NYC in the 1950's - 1970's and an idol younger players like me growing up in the 70-80's. I met Ali through jazz guitar legend Joe Beck, and was incredibly honored to be invited to record with her. The trio was rounded out by longtime Ryerson family friend and bass great George Sheck. This was another live recording with no dubbing or punch-ins."